Do you look to food to comfort, fill a void, or make yourself feel better? Do you mindlessly eat or overeat to avoid painful feelings? If so, here are 15 practices to stop emotional eating. Last week a friend texted me and asked what she should do when she feels like emotionally eating. She was having a tough time at work and all she wanted was a burger and fries to make her feel better. Yet she also knew that the burger and fries would end up making her feel worse after she finished them. So I gave her some of my favorite tips below to stop emotional eating. With emotional eating, you turn to food to make you feel better. It has its roots in many areas that can extend as far back as childhood. The happiness you felt when someone close to you fed you creates a strong link between food and love that can last a lifetime. Emotional or overeating can also fill a void in your life. If you’re not getting the attention or respect that you want, you could look to food as a replacement. Ben & Jerry’s has filled many voids for people. Have you ever had a bad day that led to a pint, or dare I say quart, of unconscious ice cream shoveling? Oftentimes you know it’s a bad idea the second you take it out of the freezer and put it directly into your lap. The problem is, you can’t stop. It’s as if you’re waiting for the ice cream to magically make you feel better, only it doesn’t, and it ends up making you feel worse. When you reach the bottom, the guilt and shame are piled on top of the existing loneliness you were already feeling. So how do you get ahead of emotional eating, stress eating, and overeating? Next time you realize that you’re reaching for food, or drink, to deal with difficult emotions, try one (or more) of these ideas. My friend started with the awareness of her desire to emotionally eat, and reached out to me for help. I gave her many of the tips on this list, and the moment passed. She woke up the next day energized and ready to start fresh. If your friends don’t happen to be health coaches, you can still talk to them about what you’re feeling. Talk about what’s going on or simply listen and support them with what they’re going through. Ideally in that time the emotional eating craving will have passed. If you don’t feel comfortable talking to a friend about your emotional eating issues, it can be helpful to work with a trained professional who will listen and offer guidance specific to your situation. As a Certified Nutrition and Health Coach, I help women develop a positive relationship with food. Learn how to work with me here. Binge moments tend to only last a few minutes. The impulse can come as quickly as it leaves so sometimes you just need to get over the initial urge. By the time you have a phone call with your friend, your mood and mind may be in a totally different place. You could hang up the phone and be ready to carry on with your day without having inhaled a box of chocolate. When you’re about to get knuckle deep in a bag of Cheetos, think about why you’re reaching for the snack. Is it to fill a void? Are you procrastinating on a difficult project? Did someone upset you? Eating can be a way of numbing pain or filling a hole. Reflect on your day and mood and see if you can target the root cause of the upset you’re feeling. Then see if you can thoroughly examine the emotions you’re feeling, and break it down so it no long consumes you and your food choices. Think about what you really want. Is it companionship, purpose, laughter? Look for other ways to get your needs met. When I coach people, I have them start by sharing why they want to make a change. Reasons can start with wanting to lose weight or to get a new job, but when I dive deeper, I learn that it’s much more. People want to have energy to play with their kids when they’re older. They also want to help people and make a difference in the world. Keeping your bigger goals in mind can keep you on track when you’re feeling unstable. Eating a big bag of chips is not likely to help you on your path. If you’re debating on eating another, or 10th cookie, think about how your decision will feel later today, tomorrow, next month, or next year. Are you going to feel good about it? Then look at the bigger picture. What is the eating preventing you from doing more long term – lose weight, find the relationship you’ve been looking for, get a new job? Often times emotional eating and overeating causes great shame and disappointment. I’ve felt this very shame WHILE I’m doing the binge eating. I can’t even enjoy the food before the shame sets in. So I try and start with the feeling that will come AFTER I make my choice to eat something. Then I pick something else on my list to do and the moment passes. Sometimes I’m just bored when I go to the fridge. Maybe I didn’t plan any fun social activities. I may not have reached out to a friend in a while so there’s not much on the calendar. I can also be trying to avoid working on a difficult project so I go looking for a snack. Staying an appropriately busy can help me from emotional eating. Whenever I’m working on a passion project that lights me up, hours fly before I’ve realized that I haven’t eaten in hours. Keeping the calendar full of experiences and events that bring you joy and purpose can help alleviate mindless eating. If you need help with finding your purpose, read more here. Movement is a great distraction from emotional eating. I have a few go-to songs that are my “fight songs.” I think everyone should have a song that lifts him or her up. I like to dance to my song, but if dancing isn’t your jam, then simply take a walk and move your body. In the office, climb a few stairs to get your blood and adrenaline moving. Do some pushups or stretch to remind yourself how strong you are and how vital your body is. Movement can help alleviate any anxiety or stagnant emotions that won’t budget. Bonus points for taking a walk with a friend to get some social time in, as well as time to talk out any pressing issues. Doing your movement outdoors is another good two-fer. Not only will the light wake you up, it will also help balance your cortisol levels so your energy stays high. You want your cortisol up during the day and down at night when it’s time to sleep. Whenever I get outside around trees, it helps me see the bigger picture. The size and beauty of being in a forest shifts my mind from trivial things, like salty chips, to a larger view of what’s really important. Whether you meditate or not (if you don’t, start here), try relieving some of the stress and anxiety you might be experiencing by taking some deep cleansing breaths. Practice long, slow breathing to relax and get yourself out of your head. You can also sit in a chair with your feet under your hips and your arms placed loosely in your lap. Close your eyes and slowly breathe in for the count of 4, hold for 4 beats, and then exhale slowly for another 4 counts. Repeat this 3 times and feel what a difference it makes. I’m sure I’m not the first to tell you that getting enough sleep is super important. Not only is it beneficial for your energy and brain function, but sleep can also affect your food choices. If you get less than 7 or 8 hours a sleep in a night, you might wake up tired and with some serious food cravings. I know if I only get 5-6 hours, I wake up famished and ready to eat everything, though heavy carbs are at the top of the list. So be sure to get your zzzzs so you can maintain a healthy relationship with food. What feels like hunger pangs in your body can often be dehydration. Whenever I’m feeling hungry way too close to my last meal, I start drinking water. After my body has time to digest the water, I find that my so-called hunger pangs have dissipated. If water sounds way too boring when you’re measuring it against a box of donuts, try sprucing up your drink. Add lemon, cucumbers, ginger, mint, or fresh fruit for your own spa water that will leave you feeling refreshed. To avoid reaching for food too often, take a look at the meals you’re currently eating. Do they have a good mix of fat, fiber, and protein? Each of these components will help fill you up. You want and need all three to feel fully satiated after a meal. Healthy fat from avocados, nuts, and coconut milk will not only help most people’s bodies operate more efficiently, but it will also help to ensure that you’re not hungry an hour after eating. 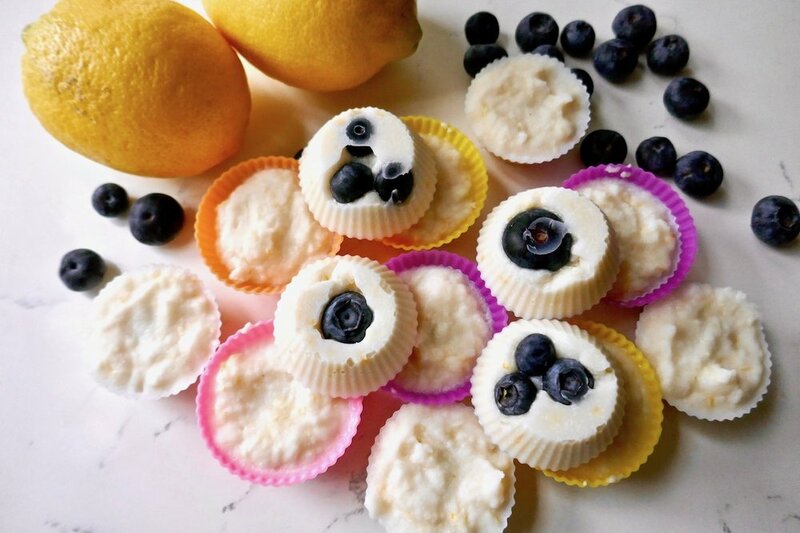 My lemon fat bombs are a good source of fat and a naturally sweet treat to beat any cravings. Making a schedule of your meals and when you plan to eat each can help you with emotional eating. It takes the guesswork out of what to have and when so you’re not constantly thinking about food. If I don’t have my meals planned, I start thinking about what I’m going to eat for lunch while I’m cleaning my breakfast dishes. I can think about it for hours, especially when I’m trying to avoid thinking about other pressing issues of the day. When my meals are laid out in advance, I can free my brain up for more important activities. Sunday is my big cooking day. I usually have one (or more) of these 5 sauces in my fridge at all times so that a meal or healthy snack can come together quickly. I make a batch of smoothies and prep protein and vegetables so all my clean eating ingredients are ready to go. This also helps me avoid temptation and bad food choices later. Your body performs best when it’s on a regular eating schedule so try and stick to one. It will help both your mind and your body. When you’re having a bad day and the need to emotionally eat arises, try implementing a little self-care. Self-care can take the form of many different things. It can mean a massage, drawing a warm bath, writing in your journal, reading a good book, making a warm cup of nourishing tea, or just sitting still for a little while. It’s easy to do all of these practices when you’re in a good mood, but try and get in the habit of doing them when you’re feeling down. Hopefully those good moods will become more frequent. If you’ve run through the whole list above and are still hungry, then eat! You may not have consumed enough at the last meal or you may be recovering from a big workout or cold, so take care of yourself. You always want to keep your blood sugar stable and your energy high. Depriving yourself of nutrients isn’t going to make you feel any better. Just be conscious of the choices that you’re making so that you can avoid emotional eating and have a healthy relationship with your food. If you’d like additional help with your eating, schedule a free discovery session with me by clicking here.